This brand new Bennington pontoon boat offers the best of both worlds for your family vacation. Stocked with the best fishing accessories you can ask for like live wells anchors and down riggers. It also has the space, seating and power to play all day with our included water sports package. Tubes, life jackets and ropes. This boat seats 10 people and it is more than powerful enough to pull tubes and even skiers. This boat comes with a wave tamer package for fast performance, tubes. On-board you will find life jackets, safety equipment, ropes and an air pump. 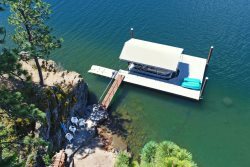 You will have everything you need to have fun on the water. If you are into fishing, just look at the 2 live wells, electric anchor and down rigger. With front and rear captains seats, you have the perfect boat to fish our awesome lakes. Just bring your poles and tackle and your set to go. Now here is the best option available for those cool spring and fall boating trips, A fully enclosed camper shell so you are out of the wind and rain. Fish from the fully enclosed cab of this roomy pontoon. When things get exciting you can step out into the open bow area, until then, stay indoors, dry and comfortable. This pontoon boat features a 115 HP motor, with seating for 10. Brand NEW for 2017! Lifting stakes let you cruise at nearly 30 MPH!